David Fabbo can design and create the more modern look of Stucco. Hardcoat Stucco presents an E.I.F.S. or Dryvitt appearance, without the use of Styrofoam directly on the masonry or wooden frame surface. 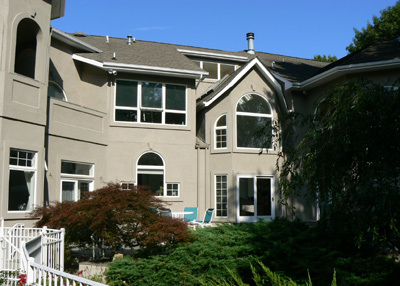 Hardcoat Stucco is available in a variety of colors and textures. Hardcoat Stucco is a combination of 2 coats of cement, with an acrylic finish coat, along with any detailed finished trim. Step Two: The second application of cement is applied evenly throughout the wall, and then sponged for a smooth float finish. Step Three: After all cement is applied, detailed trim can be added on the walls. Trim, created from foam is installed around windows, doors, corners, and etc. Standard and special ordered trim can be applied. Once trim is applied, moldings are insulated with mesh and basecoat. Step Four: The final procedure is the application of the Acrylic Stucco Finish. This Stucco base is distributed by our partner suppliers whom we have worked with over the years. Acrylic Stucco can be created in a variety of colors to just about any color imaginable. This finish coat is hand applied, followed by careful smoothing, and then allowed to set in.